SUNSET BEACH, NC – One has to wonder if there is any other place with as many quality golf courses as found in the Calabash/Sunset Beach, NC area. Sandpiper Bay Golf & Country Club certainly enhances the neighborhood’s reputation for superior golf. Driving into the Sandpiper community you are greeted by a selection of well-maintained residences. You can only assume membership will expect nothing less from their golf course. That thought plays out went you catch sight of the handsome, well landscaped, lowcountry style clubhouse. The view from Pipers Restaurant is quite scenic and features one of the layouts 40 lakes. The staff is quite welcoming and very friendly from bag drop and pro shop to starter and restaurant. Dan Maples designed the course that opened in 1987 with 18-holes. A third nine was added in 2002. Our round began on the Sand Course and finished with a back nine on the Piper Course. Sandpiper has four sets of tees. The whites are a strong 6325 yards. Par was 71 and the course rating is 69.5/123. Six par 3s and five Par 5s make for an unusual, but interesting layout. 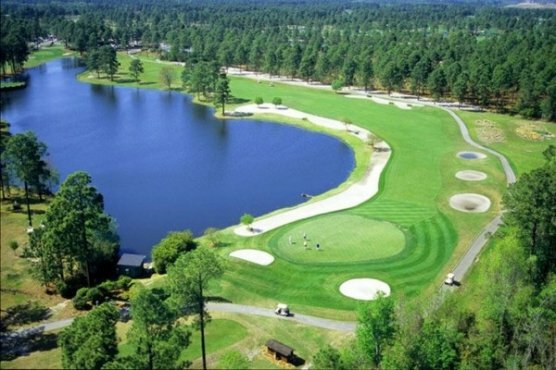 Sandpiper is a fairly traditional course with gently contoured, generous fairways lined with Carolina pines. Although aerated just two weeks ago, the Mini Verde grass greens were in very good shape and rolled true. A number of things stand out at Sandpiper Bay Golf & Country Club. There really are no sneaky holes on this course. Basically, what you see is what you get. Only on a few holes will the really long hitters have to curb their power and play something less than a driver. For the rest of us, driver is always in play. The course is deceptively long. On the Sand and Piper Courses there are five Par 5s with four going 530 yards plus. Even the 497-yarder is a three shot hole that features a sharp dogleg left at 100-yards out. A long hitter may take the opportunity and hit over the trees cutting the dogleg. No. 7 on the Piper Course is a particularly interesting risk/reward opportunity. If you try to shorten the hole, make sure your drive has enough height to clear the palmetto trees and not just the water. The Par 4s are fairly straightforward with a nice mixture of doglegs. Again, everything is right in front of you. No. 3 on the Sand Course a dogleg right over water is a lovely hole and birdie is there for the taking. The short No. 7 requires an accurate drive and a well-placed iron for a birdie opportunity. The six Par 3s on the two courses require you bring you’re “A-Game.” Water, bunkers, elevation changes and distance: everything you’d ask for in a quality course’s Par 3s, is awaiting you. At 177-yards with mostly carry over water be alert to the wind when choosing your club on the Piper Course No. 3. For our round at Sandpiper Bay Golf & Country Club we were paired with two locals from Myrtle Beach. Both were strong players and agreed the course is well worth the 30-minute drive. That alone is a pretty good endorsement for Sandpiper.